Social media has been around for just over a whopping 40 years, but it never really made a name for itself until it was around 30 years old! Yep, you heard me right. Did you know that the first known existence of social media was back in 1979 with a network called Usenet? Usenet only allowed connected users to post news and articles to newsgroups. Social media exploded Worldwide when Facebook was introduced in 2006 and it has never been the same since. Ever since then, there have been more social media networks and new ways to advertise on these! However, move on to 2017/2018 and social media is even bigger than it has ever been with Facebook currently receiving over 2 billion active users (as of June 2017) and new forms of social media taking the world by storm such as Snapchat, Pinterest, and LinkedIn. The question is, does your company have social media? 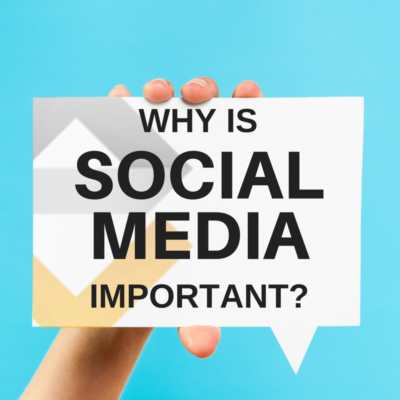 If yes, then awesome, but do you know the reasons why having social media is important? If no, then why doesn’t your company have social media? Instead of me asking questions, why don’t I just tell you about all the advantages of having social media? Let’s start with the most known reason and that is making a name for your brand. You must take every opportunity you get to make your content stand out from the crowd! Social media networks are your brand’s voice and it is a much easier way for you to branch out to new customers as well as keep your current customers engaged! Each social media network is used differently, and you need to utilize the one you use for the right purpose. For example, Instagram, Pinterest, and Snapchat are all picture-based forms of social media, whereas LinkedIn is more of a business to business social media. Did you know that brands who continuously engage with their customers on social media will receive more loyalty from their customers? As a brand, you should take advantage of the social media tools that are out there! A well-known fact is that if a customer follows you on social media after working with them, then they will become more loyal to that brand! Every time you post on social media, whether this is Facebook, Twitter or Instagram, that will open a window of opportunities for you to convert potential customers. As more users follow or like your social media page, you will get more and more opportunities to reach out to new people as well as keep your current customers engaged! You can also interact with your current or potential customers but be sure not to pester or irritate them as this can affect your chances! The same goes for every blog post, image/video and the comment you post. Every time one of these are posted, it will give your current and potential customers the opportunity to react to the content in their own way! Each time someone reacts to the content, it can lead to that person or someone seeing their reaction to visit your website or even like or follow your page themselves! However, you would need to understand that not everyone who likes or shares a post will visit your website or even like or follow your page. For example, someone could see your post and like what you have posted so they may just like the post and move along. This can turn into a positive though as every good interaction increases the chances of an overall conversion! You needn’t not fear about your Click-Through Rates (also known as CTR) though as there are always many opportunities available on social media! If we continue with conversions though, marketing your brand on social media can result in an increase of conversion rates! One of the main ways that marketing a brand can lead to conversions is by using the humanization element. What is the humanization element? I hear you ask, well it is showing your customers on social media that there are humans running the account and this can be done by simply interacting with your current and potential customers! Social media should be a place where brands go and act how people would do and that is by posting, liking and sharing things that are all relevant to the brand. All the above is important as people like working with other people, not with companies! You need to make sure that you interact with your customers regularly as this shows that you take interest in your customer’s loyalty and needs. It is important to realize that most people nowadays go straight to social media to complain, compliment or brag about a product or service. As soon as they hit that post button, your brand and its name will be shown to an audience! The more that people talk about you on social media, the more attention your brand will receive and if you can interact with all this new attention, then you have earned yourself a pat on the back! Every social media profile that you add to your brand means that a brand new pathway has opened up for users to reach you. Every post you upload onto the respected social media sites is a whole new opportunity for you to pull in conversions. The more quality content you upload, the more traffic you will generate for your website and social media streams. Social media doesn’t just benefit your companies brand as it also increases your rankings in search engines such as Google, Yahoo, Bing and more! However, with search engines, the requirements for improving your ranking are constantly changing as you no longer need to just update your website’s blog. Now you need to make sure things like meta tags, descriptions and keywords are all complete as well as distributing links that are pointing back to your website. Social media is currently, as on January 2018, a main factor in a websites positioning on search engines and that’s because some brands are stronger on social media than what they are on search engines. Going down to the core of social media, it was built to be a communication channel. Every time you receive an interaction, it is up to you how you deal with the customer, but the best way is to demonstrate your customer service level publicly. This can also work for when you make a mistake and a customer complains as you can publicly apologize to them and find a way to make things right. Finally, social media gives you the opportunity to find out what your customers like best about your product or service. A good way to do this is by monitoring comments relating to your business, product or services. Before you finish reading, just remember that the longer you wait to start social media for your company, the more you are losing out on! Now, I hope that this blog post has helped you to understand why social media is important for companies! If you have any other questions or queries about social media and any of the tips above, please contact us using Facebook, Twitter, Instagram or our Contact page! We’d love to hear from you! Also, do you know a company that could benefit in social media? Why not send our article across to them to let them know you’re thinking about them!